THE ELECTRONIC JOURNAL OF COMBINATORICS (ed. June 2005), DS #5. There is a simple symmetric 5-Venn diagram in which each curve is a triangle; see this figure, redrawn from Grünbaum [Gr92b]. Grünbaum [Gr84b] asked whether there was a 6-Venn diagram made from triangles. This question was recently answered in the affirmative by Jeremy Carroll [Car00] - his first example is shown below. The diagrams on this page are all simple. He has subsequently discovered that there are exactly 126 different 6-Venn diagrams that can be drawn where each curve is a triangle. Below is a table of coordinates for the six triangles. Below is another nicer example (this jpeg image courtesy of Jeremy Carroll). See his web page [JC] for further examples like this. Larger version of first example. An even larger version of the first example. 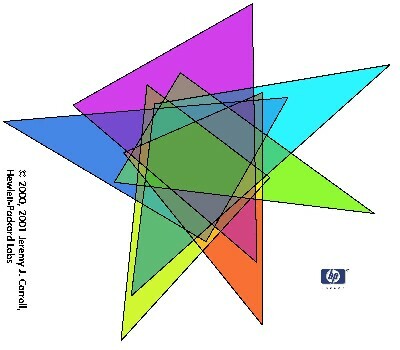 First example with coloured triangles. Larger version of first example with bipartite colouring. Clipped version of bipartite colouring. Black and white version of second example (gif courtesy of Jeremy Carroll). Another Coloured version the second example (gif courtesy of Jeremy Carroll).